there’s a hundred reasons to be grateful to live in our neck of the woods and access to delicious, fresh seafood is one of them! This week we were lucky enough to buy some prawns and Moreton Bay Bugs directly from the trawler in Mooloolaba. Last night we tucked into a feast of fresh seafood, lemon wedges and white (!) bread and butter. It was a simple dinner, but one we’ll remember. I don’t think you can beat a good prawn sandwich. 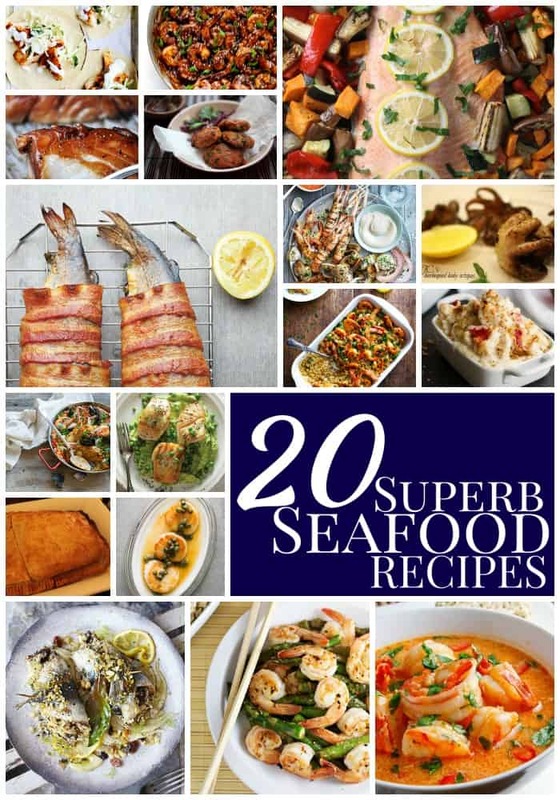 That said, here are twenty superb seafood recipes, should your tastes run to something else! This baked honey-marinated cod by no gojis no glory looks delicious. Lindsay from Pinch of Yum writes so many great recipes, she gave up her day job. This Garlic Butter Shrimp and Quinoa is both simple and superb. Wrapping a trout in bacon probably renders it unsuitable for Good Friday, but it also promises to be very very good! This recipe for Bacon-wrapped Smoked Trout with Tarragon is from one of my favourite sites – Saveur. Rasa Malaysia is a site brimming with easy Asian recipes. These Thai Shrimp Cakes are no exception. Roasted Rainbow Trout with vegetables? Maria Ushakova has this beautiful (and low fuss) recipe. I’ve been thinking about Foodess’ recipe for spicy fish tacos with cabbage slaw + lime crema since I discovered it. She’s right, tacos done right are without equal! Yes they’re ugly but salmon rissoles are a Friday night family favourite. Vietnamese Rice Paper Rolls are such fun to make with the kids. This recipe from Recipe Tin Eats even comes with rolling instructions – if your kids are old enough, hand them the recipe and take the night off! I cannot wait to try this Easy Hoisin Shrimp recipe from Gimme Some Oven. The sauce is just three ingredients! Singapore is famous for its food. This recipe for Singapore Chilli Prawns from Kevin at Closet Cooking looks the goods too. Sand crab linguine is one of my favourite ways to serve sand crab – simple yet delicious. Sharing platters is my favourite way to dine. I love the social aspect of sharing and comparing. This char-grilled seafood platter with romesco and aioli by Donna Hay looks just the ticket for a Good Friday dinner party. There’s mac and cheese and then there’s lobster mac and cheese. I kid you not. Lobster mac and cheese, romance and comfort in one delicious bowl! Scallops are such a delicate flavour that they need careful accompaniment, this recipe for seared sea scallops with browned butter and caper sauce is just what the doctor ordered! It’s still warm enough for barbecue dinners, these BBQ baby octopus are delicious little morsels that take no time at all! I love recipes that respect the flavour of fish – this recipe for Sauteed Cod with Pea Cream from Saveur is a perfect example of not overcomplicating things and letting the seafood shine. My friend Beth from BabyMac is a top bird and a fabulous cook. Her recipe for Salmon en Croute looks like the perfect Good Friday celebration dinner. I was flabergasted when I realised that sardines aren’t always those squished brown fish in the tin. Fresh sardines are divine (but not easy to get our hands on in Queensland). This recipe for Sicilian stuffed sardines is inspiring me to track some down. Need another reason to love paella? It’s traditionally made on a Sunday by blokes because women need a day off from cooking! We’ve been using this recipe for paella from SBS for a long time and it never ever disappoints! So there you have it: twenty superb seafood recipes, just in time for Easter. I can’t decide which to cook first! what’s your favourite seafood recipe?